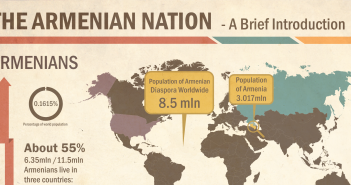 Armenia By the Numbers is a look at Armenia according to important indicators that reflect a country’s economic and social development, including Gross Domestic Product (GDP), Gross National Income (GNI) per capita, Gini coefficient, Human Development Index (HDI), and emigration rate. Here, we are introducing The Armenite MEG|A Model. The MEG|A Model is an effort to lend relevancy to the inevitable comparisons made between Armenia and other countries. Although such comparisons are commonplace, they can be incongruous or selective. Countries will always differ in significant ways so it is important to recognize that any comparison will not take into account all possible variables and thus cannot present a complete picture of reality. Nevertheless, comparisons act as a gauge of company and trajectory – or, the group of countries among which a country finds itself and in what direction that country is going relative to others. That’s what we are trying to show here. Finally, the figures in the infographic were taken from, or based on, third-party sources like the United Nations, World Bank, and the United States’ Central Intelligence Agency to ensure objectivity and consistent reporting. I like to see Armenia’s numbers compared with France, Germany, Sweden and Canada. Can the person responsible for the post/article above prepare the suggested comparisons please? Armenia’s numbers look good once we compare them with countries that are in worse conditions that of Armenia. I like to strive for the best and be compared against the best, not the worst! Excluding sheer curiosity, I see no reason why anyone would want to compare Armenia to the likes of your requests. Why stop there, lets compare it to the USA, Australia, China. Although I understand your interest in a compare/contrast model requested, I don’t see how it would give us anything more than a quench for interest. Araz…did you even read the infographic? How can you compare the 4 wealthiest countries in the world with EVERY SINGLE advantage to their economies coming from a thousand different factors, with Armenia? Strive to emulate their economic stability, I understand. Compare facts & figures against theirs? Makes absolutely no sense. I find it as an insult that 2 of the Estonian biggest islands are not marked on the picture. Thank you! When grad-school gets to be a bit much, I come to my favorite corner of the internet-Armenite.com for some leisurely reading.